"Afforestation is process of establishing a forest on land that is not a forest, or has not been a forest for a long time, by planting trees or their seeds." A railway station is a very functional facility that needs almost similar regulations and codes, especially for a transit station in suburban Jakarta, such as Depok. 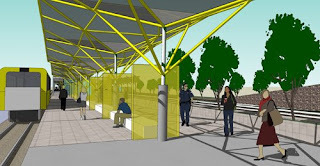 The competition focused on the design of 2 related stations as entry gates to the university (UI), one functions as transit only (UI one) and the other functions both as transit station as well as train depo for yellow line (UI two). Therefore, this time we proposed a rather evoking experience of how people travels to,across,from,and passes by the university in such way that they could grasp this campus identity or character, during few minutes of traveling. UI is known for its forest as green campus, and that's the way it should stick on one's mind when they arrive at the campus by cars, trains, or bikes. After the first round, we made it to the big 3 finalist, which we proposed almost different approach than the other two that offers big coccoon-like structures. We tend to propose the spatial experience of moving towards/inside/outside the campus which will occur only in few minutes of traveling. ForestationOne, emerge as one simple linear tree-like structures that opens many view to the forest accross, and provides meeting mall on the underground level that leads people to reach a forest access point. 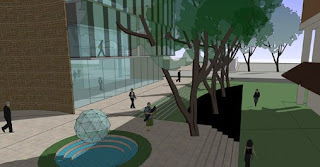 ForestationTwo that has larger area offers many access points towards one large open courtyard on upper level that opens views to the campus' greenery, as it will become the future meeting points between campus, apartements,shopping mall, and public amenities. 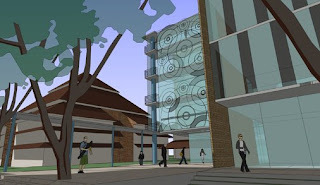 Inspired by the movement of electrons in atom (as in quantum mechanics) and its relation as part of a single entity, this Electrical Department's Quantum Plaza in Engineering Faculty should reflect the dynamic movement inside,toward,and through the new building and plaza which is located between two similar buildings of Electrical and Mechanical Department. 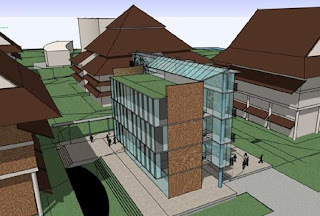 The new additional building should also stands as a compliment, not monument, to the adjacent vernacular buildings that would not obstruct the original concept of Kampong settlement in the faculty, yet maintains its contemporary looks. 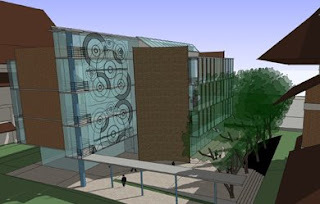 This building was designed in accordance to the LEED (leadership in energy and environmental design) codes that would state its presence as one of the environmentally oriented campus. Though we got into a shortlisted finalists, we feel sorry that Jury has finally picked contestants that may obstruct the original design guidelines of a 'unity in diversity' looks with its monumentally reason for such additional facility.